Happy Thursday! 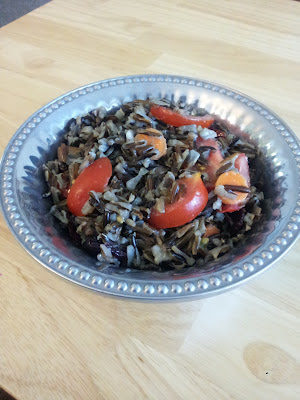 Today, I’m linking up with Kate @ Daffodils to share one of my favorite starter dishes, Wild Rice Salad, which I adapted from the National Museum of the American Indian’s Mitsitam Café Cookbook. As part of my ongoing effort to get healthy and be in better shape, especially given our upcoming fall trip to Hawaii (more details about that excitement coming soon! ), I've recently decided to try going meatless during the week. While I’m not sure I’ll easily be able to cut meat out of my diet completely, especially when it comes to weekend dinners out or special occasions, I’m doing well so far and am hoping to start viewing it as more of an indulgence rather than a staple. Perhaps one of the best things about this salad is that the list of ingredients merely provides some good suggestions, and it is entirely possible to customize the recipe with whatever seasonal combination of veggies you prefer. 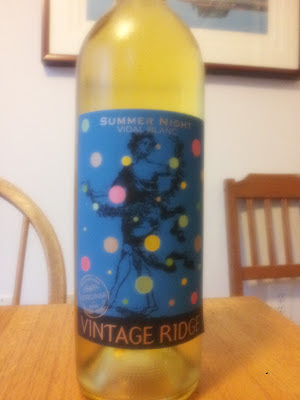 This slightly fruity dish also pairs well with a crisp and somewhat sweet white wine, such as Vintage Ridge Vineyards' Summer Night, one of my all-time favorites! What's your favorite summer appetizer, side dish or wine? In a large saucepan, combine the stock and wild rice. Bring to a boil, then reduce heat to a simmer. Cover and cook until tender for about 45 minutes. Let cool. Scoop the rice into a large bowl and add the carrot, dried cranberries, tomato, scallions, pine nuts and pumpkin seeds. Toss to mix. Add 1/2 cup vinaigrette and toss to coat. Cover and refrigerate for at least one hour before serving. Serves 4-6. Hawaii that's exciting! I'm trying to be healthier, too, but exercise is just not my thing. I've never seen a recipe like this. Thanks for linking up! I will have to try it soon. i've never heard of that dish!! This recipe looks really good, and easy to make vegetarian by substituting the chicken broth for vegetable broth. I have blogged a lot about my corn salad, and that is quickly becoming my favorite summer dish. My friend and I tried a new wine a couple of nights ago - Tintero's Mocato d'Asti. It was really yummy! thanks for sharing this recipe! My husband and I are also going meatless but for the whole month just to try and see if we can do it! Salad looks yummy, how exciting to hear you are going to Hawaii, can't wait for more details! That looks delicious! Great job! I love avocado things in the summer and Moscato. I can't wait to hear about Hawaii, that will be AWESOME! My favorite summer wine is sauvignon blanc, and my favorite appetizer for summer is bruschetta. Now that I am looking at this...what's for dinner tonight. I'm gonna have to give this a try! I really like wild rice, This recipe/book looks delicious! I love seafood during the summer...but I recently started putting strawberries into my salad and I have to say, I'm in love!! I havent been blogging too much, need to catch up. I hope your family is doing well. Im always thinking about you sweety! Yummy that looks amazing!! I will def. have to make this! This looks so good! I'm bookmarking it to try sometime before summer ends. That looks so delicious. I had actually never tried any rice whatsoever until a few years ago and now I love rice. This looks like it would be really good -- especially at this time of year. I might need to try it! Thanks for the recipe! The vinaigrette sounds divine! That rice dish sounds great. Good luck with eating less meat.